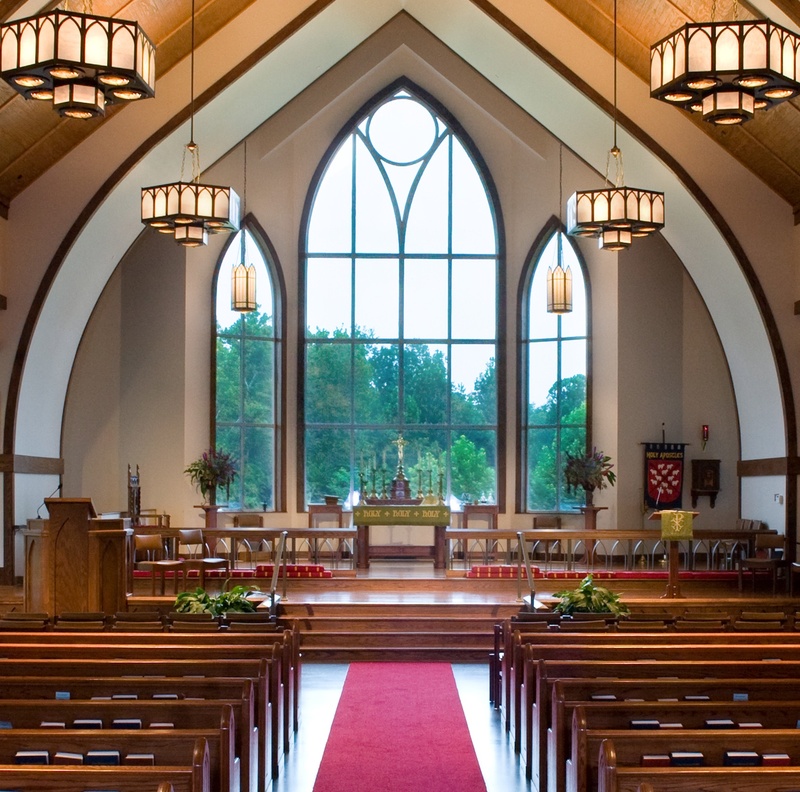 The church has a classical basilica floor plan which is combined with spacious Gothic arch windows to give the church a light, open feel while retaining traditional features. 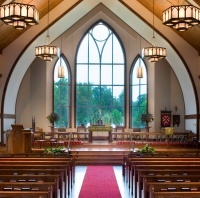 The Gothic arch pattern occurs throughout the church in groups of three, calling to mind the Trinity. The altar, commissioned by the Altar Guild as a gift for this church, was designed and built by parishioner, Allan Klodzinski. The base of each leg of the altar is made of lumber from the nave of the original Church of the Holy Apostles, reminding us of our foundation in that church. Many of the furnishings from Bishop Otey Memorial Chapel have found a home in this sanctuary: the bishop’s chair, the candlesticks on the altar and retable, the cross, the cushions at the altar rail, and the aumbry. The processional cross and torches are from the original Holy Apostles. The Baptismal font is located near the rear door of the church to remind us that we enter the church through the sacrament of Holy Baptism. The font is coupled with the Columbarium to link two of our Easter liturgies, Baptism and Burial of the Dead. The windows by the font face the east, so each morning the light of the new day sweeps across the font and onto the Columbarium bathing both in resurrection rays. The Baptismal font itself and the Paschal candle stand are gifts from Bishop Otey Memorial Chapel. When Bishop Otey closed in 2002, the congregation gave many of its lovely furnishings to Church of the Holy Apostles and now they are once again being used in the worship of God. The font dates back to 1902 and came to Bishop Otey from the chapel of the Sisters of Saint Mary, an order of Episcopal nuns. The choir sits on the platform across the aisle from the Baptismal font. They sing from the rear of the church because their role is to support the congregation in our mutual worship; we all sing with God alone as audience. This large multi-purpose building which adjoins the educational and administrative wing serves the parish in numerous ways - classes, forums, dinners, socials, sports, and various outreach groups.